The exclusive and sporting versions are traditionally called John Cooper Works and the newest masterpiece introduced in Frankfurt bears the badge saying Challenge. This means that this fresh new Mini was developed for use in hard racing conditions, especially in the Mini Challenge Racing series. Mini John Cooper Works Challenge won’t be even approved for use on the roads, its existence is primarily and only for racing. This car is based on the most powerful civic version of Mini Cooper S, but its 1.6 4-cylinder engine is dramatically rebuilt to achieve great output and better curve of torque. 210hp is produced by the engine with a modified turbocharger, pistons, suction system with sporting filter, improved exhaust system with sporting catalyzer and of course with a remapped ECU. Value of torque can be temporary even 260Nm thanks to the engine’s over-boost function. But not only was the great performance the goal. You need also some nice traction to use this power. The main source of the necessary traction is a adjustable roof spoiler with aerodynamic diffuser including a double exhaust tip. The suspension has also crucial function in here, so the stock one was completely replaced with a sporting kit by KW Automotive with fully adjustable elements. High performance sporting brakes with four-piston brake calipers stop the light Mini from 100kmph just in 3.1 seconds. The exterior bodykit of Challenge is made by John Cooper Works and 17“ Borbet alloy rims are really fancy. Despite of the racing nature of our Mini John Cooper Works Challenge, the car is not available only for racing teams but also for private enthusiasts for 49.900 Euros VAT included. 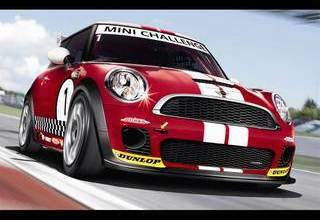 What is your opinion about the MINI John Cooper Works CHALLENGE?